Cube, Quarto and Sixto Lockers are ideal small compartment lockers. They are a terrific solution for on-site storage of personal bags, mobile phones, keys and electronic devices. Already a popular choice for schools and also in colleges, gyms, staff rooms and many offices. They instantly help to create both a tidy and also hazard-free environment. 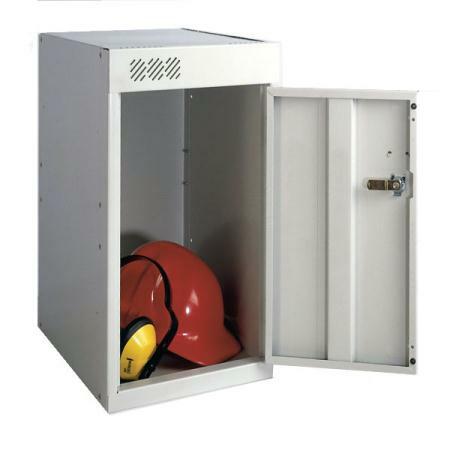 Quickly assemble cube lockers on-site into a configuration to fit any available space. Turn a corridor wall or under-stairs area into a simple, user-friendly storage solution. 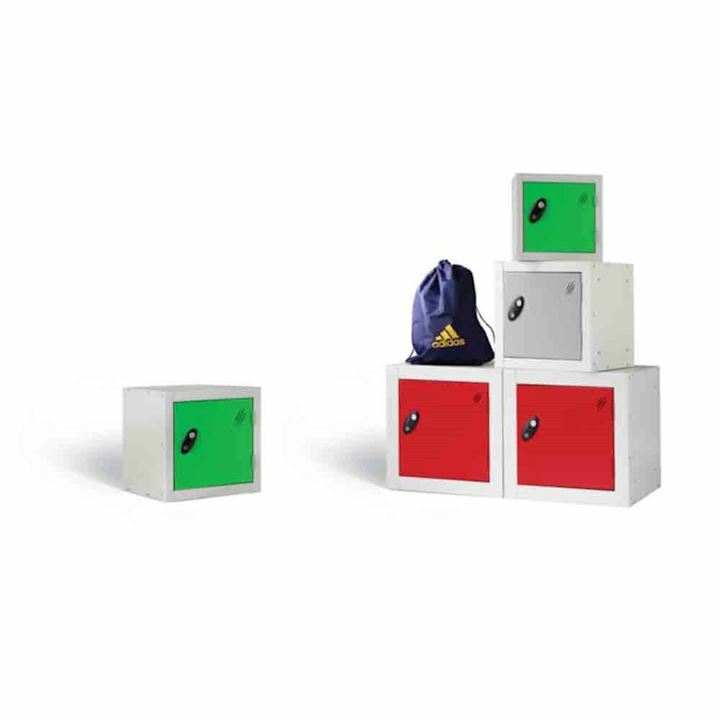 Many customers configure cubes, quarto or sixto lockers to replicate their official company colours or logo. Hence why our locker range is so popular. In times where we are increasingly infection-conscious in public or work spaces, all our 3D small lockers are treated with Biocote as part of the manufacturing process. This anti-bacterial powder coating offers lifelong protection from dirty fingers, reducing surface bacteria by at least 94%. 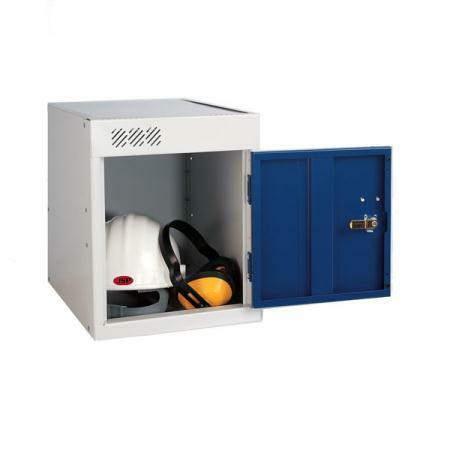 These 3D sixto, cube and quarto lockers all offer a strong and robust steel construction with reinforced doors and ventilation holes at the rear. Pre-drilled holes on the locker base make them easy and quick to stack into your chosen configuration. 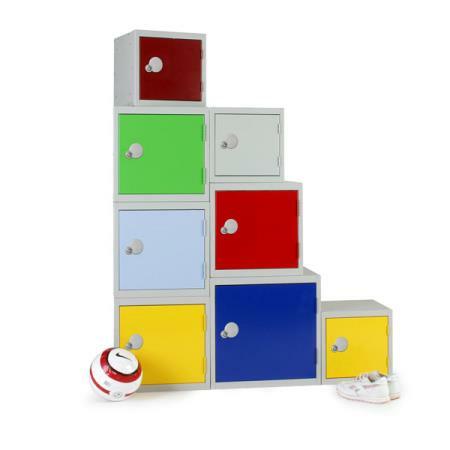 Our mini lockers come with a range of locking options. You might choose models with a camlock (into a slot in the frame for added security) and two key combination. Alternatively, you might prefer hasp and staple lock (for use with your own padlocks), dial combination (with multi-user facility), or coin retain or return, all to ensure secure storage. Masterkeys are also available on the checkout page when ordering. Simply click on the cube, quarto or sixto options for full details of each individual model. This includes your terrific choice of sizes, nesting combinations, and locks to best suit your own space and locker needs. 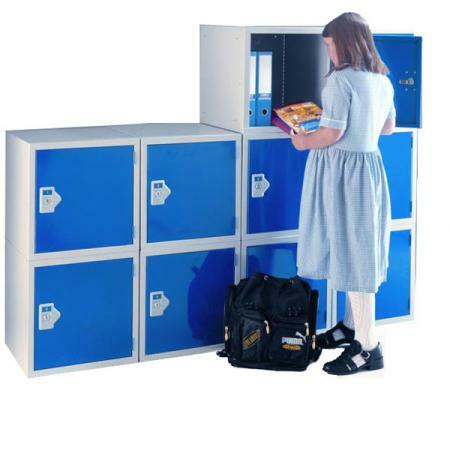 Whether you require lockers for school children to leave their bags and books, or for another educational, health, leisure or workplace environment, these terrific compact and stackable 3D lockers offer simple and long-lasting storage. You can order these competitively-priced flexible storage solutions online today and, if your order totals more than £150, we’ll provide mainland UK delivery completely free-of-charge! Also, if you require more than ten of these terrific products, please call our friendly and helpful sales team on 01924 240291 to see if you qualify for a special bulk discount. It’s also the same number if you have any questions about these, or any other, of our huge range of 3D products.